Since last Friday, President Donald Trump’s executive order to suspend immigration from seven majority Muslim nations — Iran, Iraq, Syria, Libya, Sudan, Yemen and Somalia — has caused a national debate and protests. The order has also spurred a number of court cases that may wind themselves all the way to the U.S. Supreme Court. Some see the fight over President Trump’s nominee, Judge Neil Gorsuch, to sit on the U.S. Supreme Court as a proxy fight to the Trump executive order. The Trump order suspends the issuance of visas and other immigration benefits to nationals of the listed countries. According to description from Bloomberg, the order “bars Syrian refugees from entering the U.S. indefinitely, and all other refugees — people fleeing their homelands claiming persecution or fear of violence — for 120 days. 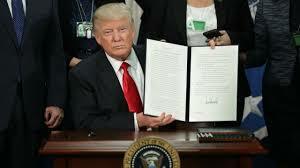 It also blocks entry to the U.S. for 90 days to citizens of seven mostly Muslim countries.” This order impacted a small percentage of travelers in the chaotic hours after the issuance of the order, yet it may impact tens of thousands of visa holders over the next few months if it is allowed to be reinstated by the courts. One of the interesting arguments that has caused the most controversy is the breadth of the order. Tech companies have teamed up to argue that the order is over broad and has barred people from entry who pose no threat to the national security of the United States. Tech companies have employees who can’t get into the United States for work right now and that has lead them to fight the order as applied to these companies in the courts. Bradford Smith, President and Chief Legal Officer for Microsoft wrote to Secretary of State Rex Tillerson and Secretary of Homeland Security John Kelly on February 2, 2017 that these Cabinet officials should use authority under Section 3(g) of the executive order the create an exception for “Responsible Known Traveler with Pressing Needs.” Smith suggests that people who hold one of three types of visas, no criminal record, specific work or family travel to a listed country for less than two weeks and/or with a ban on business travel to those nations. If those conditions are met, then Smith believes that a suitable exemption will be carved out that will allow many in the tech sector to avoid being caught up in President Trump’s executive order targeting potential terrorists. It is unlikely in the short term that these Secretaries will take the advice of the tech sector over the President until the courts complete a constitutional analysis of the pending cases. This issue may end up in Congress with a debate likely to happen in the Senate when the Senate takes up the Gorsuch nomination in the next few months. When Neil Gorsuch comes before the Senate Judiciary Committee he will be asked if this executive order is consistent with the power of the President to protect national security or if it conflicts with a constitutional mandate that there be no establishment of religion implementing a religious test towards refugees and visa holders. Gorsuch will also be asked if this order is overbroad and bars individuals from entering the United States who pose no threat and were not the target of the executive order. Microsoft is not the only company caught up in the cross fire. Facebook, Google, Apple and Amazon are all involved in the court fight to protect the holders of H-1B visas who pose no security risk. These visa holders have already been through some extreme vetting and they have been the subject of criminal check, the existence of employment, a place to live, and documentation. These foreigners need to stay within our borders because Americans can’t simply take over the important cybersecurity jobs that these H-1B visa holders currently fill. Currently,over 209,000 cyber security jobs in the U.S. are vacant, and postings are up 74 percent from ﬁve years ago. While American schools are certainly starting to ramp up their computer science education instruction, the truth is that we don’t have enough domestic experts to meet demand just yet. Americans’ security is important, why is why Microsoft’s believes that it’s exception to the executive order should be granted as soon as possible. Expect the battle in the courts to head to the Senate during the confirmation of Neil Gorsuch. Although the fight over the Trump executive order is a battle between the executive branch and the judicial branch of the federal government, that fight may shift right over the United States Senate with the president’s nominee to be on the High Court a referendum on Trump’s refugee policy.